Take a moment to say a silent thanks for your jaw. It helps you talk, drink, chew, and make facial expressions without thinking twice. That’s part of why jaw pain can be so frustrating—it’s impossible to ignore. Jaw pain can have various causes, but on the plus side, doctors have plenty of ways to address this issue. Here are a few reasons why your jaw is aching. People who are under stress or have anxiety can develop parafunctional habits, Robert S. Glickman, D.M.D., chair and professor of oral and maxillofacial surgery at the NYU College of Dentistry, tells SELF. This basically means they use their mouths or teeth in ways beyond their intended functions, like chewing food. Grinding your teeth (bruxism) is a classic parafunctional habit. It happens when you clench your teeth together without realizing it, which can create a lot of tension in your teeth and jaw, along with the muscles, tendons, and ligaments that support your jaw, Dr. Glickman says. This can leave you in serious pain. Doctors aren’t totally sure what causes bruxism, but stress is a major risk factor, according to the Mayo Clinic. Grinding your teeth when you’re awake can be annoying and painful, but at least you might be aware it’s happening and can try to stop it. Sleep bruxism, on the other hand, can be harder to quell. The theory is that it’s connected to what’s called the arousal response, which is a change in the depth of your sleep (when you sleep lighter or wake up). If you suspect that you’re grinding your teeth at night, your doctor may prescribe a night guard, which acts as a protective layer between your top and bottom teeth to help relieve grinding-related tension. They may also have tips on how to deal with stress that could be behind your bruxism. 2. You have a TMJ disorder. 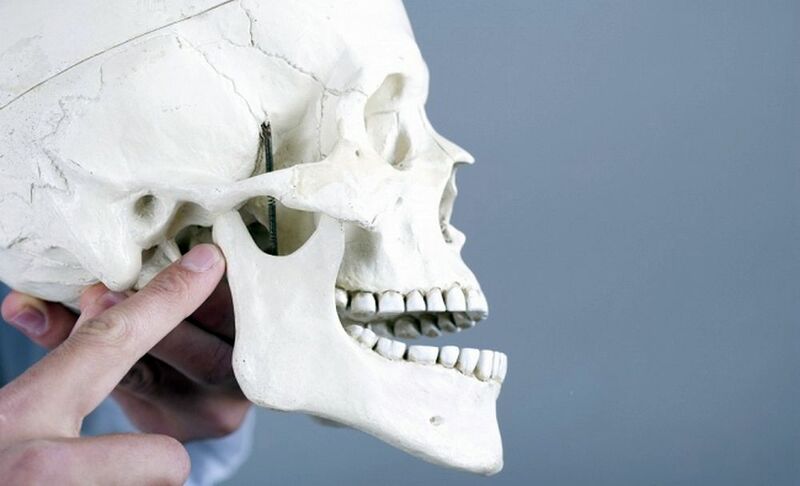 You have a temporomandibular joint (TMJ) on each side of your jawbone to act as a hinge that connects your jaw to your skull, according to the National Institute of Dental and Craniofacial Research (NIDCR). Like most parts of your body, sometimes your temporomandibular joints can act up. Although there’s a variety of TMJ disorders, they share jaw pain as the most common symptom, says the NIDCR. Others include jaw stiffness, difficulty opening your jaw, your jaw feeling “locked,” painful clicking or popping when opening or closing your mouth, and a change in the way your upper and lower teeth fit together. The scientific jury is still out on what causes TMJ disorders. If your doctor thinks you might have a problem with your temporomandibular joints, they’ll probably perform a physical exam and imaging tests to see what’s going on. Luckily, the pain is typically temporary or at least doesn’t get worse, according to the NIDCR. That’s why the first line of treatment for the most common TMJ disorders is pretty conservative. Your doctor may recommend that you take anti-inflammatory medicine like ibuprofen, apply ice packs to further reduce inflammation, rest your jaw by sticking to soft foods, avoid opening your mouth widely for a set period of time, try to reduce stress, and maybe use jaw stretching exercises (they can suggest which would be best based on your specific case). 3. Something’s wrong with your bite. When you have a “good” bite, all of your teeth are lined up with each other when you chew, Dr. Glickman explains. But with a “bad” bite, you may only have a few teeth line up, like the ones in the back. Bad bites can come in various forms, like an overbite (when your upper teeth overlap your lower teeth) or underbite (when your lower teeth overlap your upper teeth). Having an uneven bite means your jaw can’t function as it should, which can create wear and tear and resultant pain in its joints and muscles, Dr. Glickman says. Doctors can usually fix this with braces, but in extreme cases, surgery may be necessary. 4. You’re dealing with an untreated cavity. Plaque is a buildup of grody bacteria that comes from food and drinks, and if you don’t clean it often enough, it can break down the enamel that coats your teeth. Boom, now you’ve got a cavity. But it’s when that cavity works its way into the dentin, the layer underneath the enamel, that you typically start to feel discomfort, Dr. Glickman says. If it continues down into the pulp of your tooth, it can cause pain to radiate around your jaw. If your cavity is small, your dentist can fill it easily (hopefully without a long lecture, because sometimes cavities just happen, OK?!). But if it’s an advanced cavity, you may need a root canal, which involves going deeper to remove the diseased part of your tooth and fill that empty space. 5. You have an impacted wisdom tooth. Wisdom teeth are the third set of molars people usually develop in their late teens and early 20s. Not everyone gets them since they don’t perform a function (you don’t need them to chew, luckily). But if you do get wisdom teeth, you’ll typically develop two on top and two on bottom. And if they don’t have enough room in your jaw to break through your gums properly, they can become trapped (aka impacted). “This is common with third molars,” Gregory Ness, D.D.S., F.A.C.S., a professor of oral surgery at The Ohio State University, tells SELF, adding that it’s a prime suspect behind an achy jaw. If your doctor thinks your jaw pain is due to impacted wisdom teeth, they’ll usually do a dental X-ray to see how they’re positioned in your mouth. If they’re definitely impacted, they’ll remove them surgically. Learn more about what you can expect before, during, and after that procedure. If you’re suffering from jaw pain, don’t wait on it. Dentists can usually pinpoint the problem and get you on the road to recovery pretty quickly. But it’s also worth noting that when accompanied by other symptoms, jaw pain can be linked to serious health issues like chronic headaches caused by a TMJ disorder, and they can even be a sign of heart attack in women. Getting it checked out can either offer peace of mind or the chance to treat the underlying cause at the root of your pain.